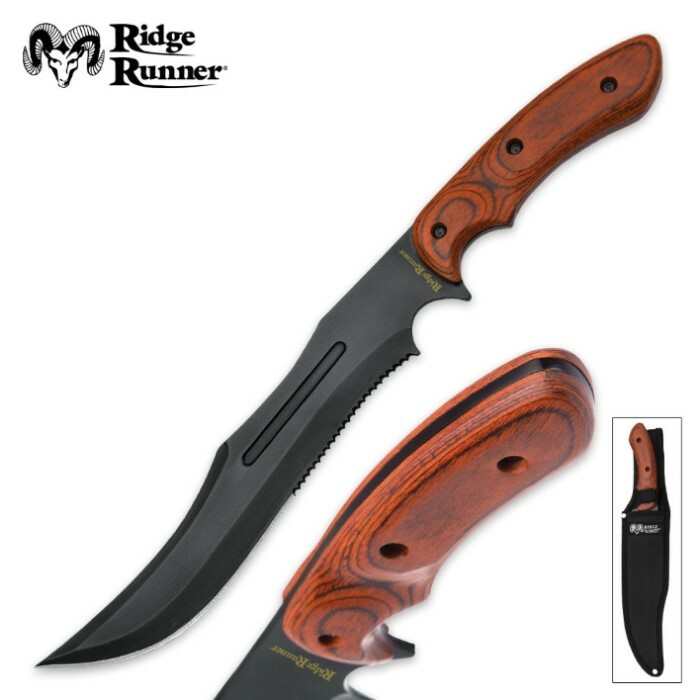 Ridge Runner Woodsman Survival Fixed Blade Knife with Nylon Sheath | BUDK.com - Knives & Swords At The Lowest Prices! The Ridge Runner Woodsman Survival Fixed Blade Knife is a massive knife that will be your go-to monster when you're out in the wild. Aside from defending yourself from what may lurk in the thick bush, you'll find many practical uses for it. It features a black 9 1/2" 3Cr13 stainless steel blade with partial serrations and a versatile clip point. The sturdy handle is made of stout pakkawood, and the blade is full tang. This massive fixed blade is 14 3/4" long overall. 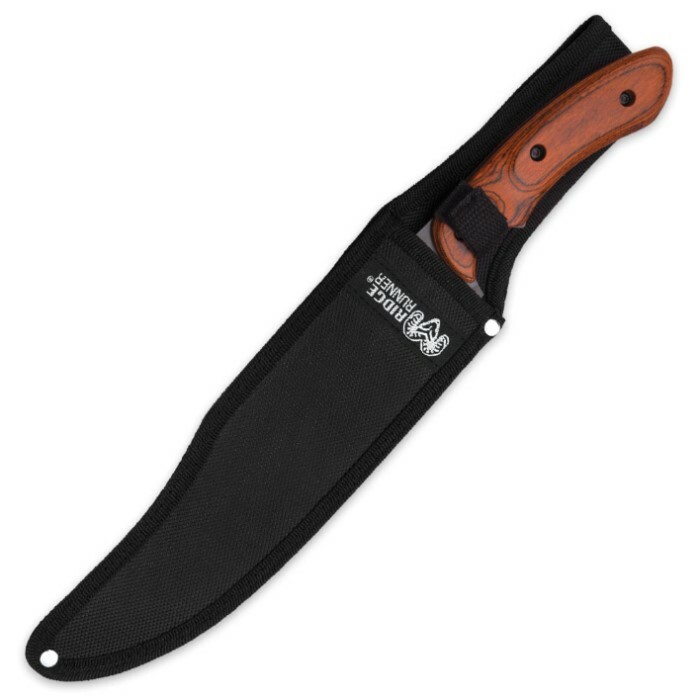 The included tough nylon belt sheath resists tears and fraying in thorns, briers and other back country hazards. Forged Warrior Jungle Beast Short Sword - Ultratough High Carbon Spring Steel; Solid One-Piece Construction - Genuine Leather Handle, Sheath - Samurai / Ninja Style - Functional, Battle Ready - 27"
I received this knife along with another a couple of days ago and I love it, actually I love both! I love bowie knives and I use them for yard work and for camping, I also take them fishing with me. They come in really handy in the field. The curvature of this blade is going to make chopping vines a snap. It came sharp enough but that doesn't matter to me, I can sharpen it more if I need to. Sheath is nylon but recent but I always make my own anyway. Great knife and great service! Five stars! Just got this knife in the mail today, and have to say I am very impressed! First, it came earlier than stated or expected, and when opened, found it to be razor sharp. And the Pakkawood handle is beautiful. As for the price, I am sure you can rightly sell this blade for 2 or even 3 times your asking price...Especially because of the thickness coupled with the fact it is a full tang knife. 5 stars on all accounts! Thank you! Wow !!! This is an absolutely top notch knife. Absolutely recommended for serious knife lovers on a low budget. BudK for Congress!!! I was pleasantly surprised with this knife. 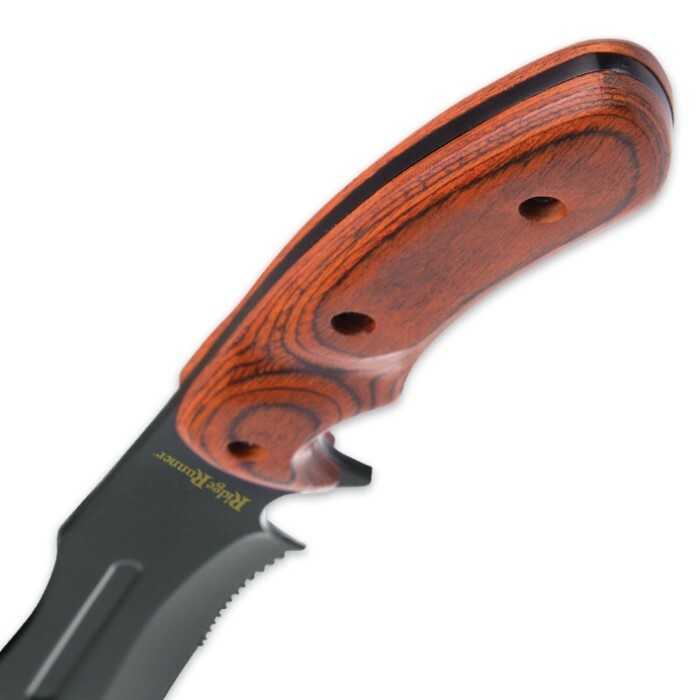 Contrary to earlier reviews the sheath is okay (functional but clumsy Velcro retainer strap) and the pakkawood (phenolic-impregnated wood composite) panels are symmetrical, at least to the naked eye and feel. While the word "Survival" is used in conjunction with this product, gratefully the grossly over-used word "Tactical" is not. But personally this knife actually seems to fill both roles nicely. Photographs initially struck me as an overgrown steak knife but now having one in hand I'm ready to purchase a couple more as gifts (one of which will undoubtedly go into my Christmas stocking). Just got this Knife .Blade is good but handle is not even (Smaller and Not as Thick on one side ) Sheath has large hole in stitching . (About 3 inches long ) . Was very surprised by this because Ridge Runner is one of their best knives . Talked to chat person and they are going to send me another . No Questions ,just ask order Number and said they would replace it . This is Why I buy a lot of my Knives from BudK they treat you right and always make it good with you .Thanks BudK your the best . This is a very nice knife. It looks good,feels good in your hand,is sharp,and is a good value for the price. Get a couple of this one. Took a while for these to come in. Now I've gotta order another one. Love it. The handle has a great feel even with different sized hands. With a smaller grip, you can choke-up on it with your index finger in the choil. Larger hands can grip it normally. Sick deal for $10! These should ship monthly like the BudK ammo-subscriptions. This is one awesome blade and well-designed. For ten bucks! Get two.